The rest of the mantel is also filled with my DIY creations. The apothecary jar is full of my three-dimensional vellum heart garland I made last year and used on a the mantel. And I added my wood shim heart I made earlier this year. The garland is made of the glittered book page hearts I also created especially for this year: I reused my Frappucino “LOVE” spray painted bottles, from last years mantel, and then filled a large vase with twine balls and dollar store heart twine. I love it even when it isn’t lit up. But when you plug it in, the magic happens. 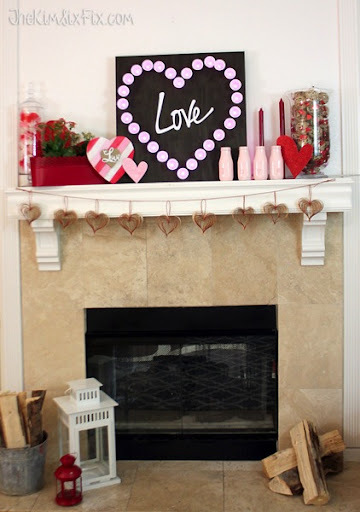 I added a few dollar store glittered hearts to both the mantel and the shelves, and I called it “finished.” I’m pretty sure there is no mistaking this is a Valentine’s Day Mantel, with all the hearts and LOVES. Wishing you and your sweetheart a very loving Valentine’s Day! !